Formula 1 vehicles are the pinnacle of automotive racing technology. The culmination of approximately 80,000 parts to create an incredible machine capable of reaching speeds of up to 229 mph. However, only one of these components actually comes into contact with the road, and that is the tires. The tires on each F1 vehicle erode differently and are put under different stresses depending on how each driver drives his car. This makes the tires on an F1 car the single greatest variable racing component on the car, thus making everything from the construction of the tire itself to the driver and crew scheduling pit stops extremely important to the winning of a race. During the course of a race the tires on a formula 1 car are put under ridiculous amounts stress trying to cope with the incredible friction and downforce produced by the extreme speed and torque of the vehicle. Downforce generated can be as much as a tonne and when paired with the friction, it causes the tires to wear extremely quickly. While the average car’s tires have an average life of 16,000 km or 10,000 miles the F1 tire is designed to last anywhere between 60 and 120 km although it is remarkably more durable than the average tire. Made of a mixture of synthetic and natural rubber compounds, carbon, sulfur and oil with an under layer of weaved nylon and polyester the F1 tire is as intricately designed as any other part of the vehicle. Not only is it designed to handle the stress exerted on it but it is literally designed to provide the best possible grip on the track. 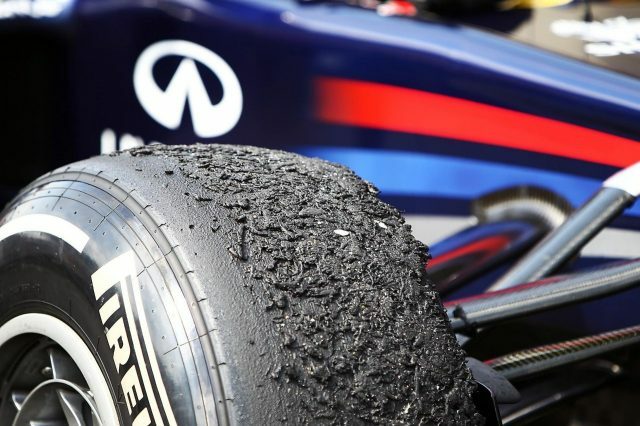 Since 2007 all the competitors in the F1 Championship were made to use tires from the same manufacturer, Pirelli. This was in attempt to further remove the variability of the performance capabilities of the vehicles and level the playing field. This however, has only lent itself to a greater emphasis on tire management by race crews in an attempt to create the perfect race set up where the driver always has the freshest tires possible at any given time. 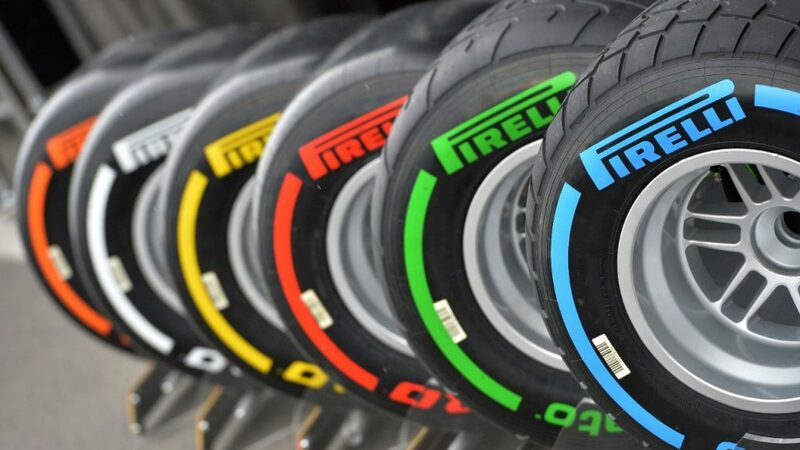 Race crews are given two types of dry tires at the beginning of every Grand Prix weekend: a hard tire called the “prime” tire and a softer version known as the “option” tire. The prime tire offers more durability while the option tire offers more grip. More grip usually means more speed but the increased softness also mean that it wears more quickly. Teams must, however, make use of both variations during the course of a race. The tire variations don’t stop there though. Pirelli actually changes the composition of the tires themselves by adjusting the rubber compounds for every different track. Tires are made based on the knowledge and information presented about the track and its conditions to provide the best possible tires for each event. Pirelli also provides wet tires if the occasion requires it and they are works of engineering genius. The fully treaded wet tires are mathematically designed to cast off as much water as possible from the road in an attempt to create better grip between the tire and road. When at full speed the full wet tires can cast of as much as 65 litres of water per second. That is a little more than 17 gallons of water every second. Failure to cast off enough water results in what is known as aquaplaning. This is when a layer of water remains between the tire and the road causing the vehicle to greatly lose traction. In essence the car is skimming the top of the water as opposed to actually driving on the road. This is extremely dangerous as control of the vehicle is reduced to a minimum and most drivers absolutely hate driving under these conditions. All in all one has to marvel at the engineering feats that go into something that looks as simple as a tire. In terms of function, F1 tires truly are remarkable and indeed crucial, but there are great adventure opportunities for those who own an SUV on a 4×4. Not just to the management and winning of a race or even a season but to the safety of the drivers and the minimizing of risks that these brave souls take for our enjoyment. Who knew so much science went into burning rubber? !